ST. MICHAEL, Barbados, Fri. Feb. 26, 2016–A two-day seminar which sought to educate the regional media on legal matters, held at the Radisson Hotel, came to an end on Wednesday, February 24. The seminar was an initiative of Improved Access to Justice in the Caribbean, IMPACT Justice, which is based at the Faculty of Law Institute at the University of the West Indies, Cavehill Campus in Barbados. Tony Nicholas, Editor of St. Lucia Star newspaper, told Amandala that the workshop allowed media practitioners from across the Caribbean to build ties and become informed of the happenings in the other countries and to share and compare information. Velma Newton said that IMPACT has been actively involved in the training of mediators to equip them to help those in their communities who have a dispute, to prevent the dispute from escalating and turning into a matter for the court. 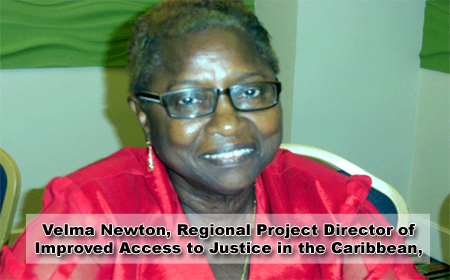 Newton added that the mediators will allow for a reduction in the cases that the court sees. At the close of the seminar Newton mentioned that IMPACT will be in Grenada on February 29 to March 4, for a 5-day workshop on alternative dispute resolution (ADR) components. Then in April IMPACT will be in Belize, where they will be holding a workshop focusing on the rights of indigenous people in the region.